Trust in me. What do we really know about trust? It may be the subject of numerous books and conference papers, bandied about on social media, yet it’s clear that few of us understand why it’s essential rather than desirable to good customer management. Two years ago, in a bid to find out why this is, I embarked on a Doctor of Business Administration (DBA) at Southampton University. I wanted to know what exactly trust is, whether organisations can develop it, and if so, how, and what quantifiable gains it brings them. 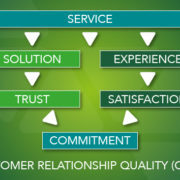 Throughout my career in sales and customer management, I’ve always been fascinated by the interaction of complex B2B relationships. But for me, the real spark ignited researching my MBA dissertation, where it emerged that trust was one of the foundational pillars of a bonded customer experience. Since, then I have continued my research, both academically and applied, working with the financial, medical devices, life science, pharmaceutical and industrial sectors to apply insights and knowledge to create new solutions. In the 18 months I’ve been studying, I’ve found it hugely informative, stimulating and frustrating. It’s exciting to participate in creating new knowledge which sheds light on ways trust works within B2B. It’s frustrating to see how academia and commerce rarely co-operate when there’s such benefit in joining forces. It’s rewarding to use the research to develop new business solutions which practically help clients to improve relationships. Our understanding about the way trust works is changing all the time. Over coming months, I’m going to share the latest thinking from the Doctorate which, I hope, can shed light on why trust is not just desirable, in B2B but imperative. If You Only Do One Thing….ENSURE YOUR PEOPLE KNOW WHAT THEY ARE TALKING ABOUT AND DO WHAT THEY SAY! Mark Hollyoake http://customerattuned.com/wp-content/uploads/2016/05/logo.png Mark Hollyoake2016-04-26 12:00:392016-06-07 08:42:25Trust in Me?